The mother and sister of Keisha Atkins, who died last year at the age of 23, have filed a wrongful death lawsuit against the notorious late-term abortion business Southwestern Women's Options (SWO). The University of New Mexico, which referred Atkins to SWO for an elective abortion at 24 weeks, is also named as a defendant, as is the pathologist who designated the botched abortion death as "natural." The lawsuit states that Atkins went to SWO on February 1, 2017, for the abortion and claims SWO violated the New Mexico Unfair Trade Practices Act in its discharge orders that "instructed Keisha Atkins not to contact or consult any medical facility, hospital, doctor, emergency room or nurse outside of employees, agents and/or staff of the SWO clinic." According to the lawsuit, Atkins returned to SWO on February 3, 2017 with a high fever and troubled breathing. Ten hours later, the suit claims doctors at SWO called for an ambulance to take Atkins to UNM Hospital where she later died. Also named in the lawsuit is Pathologist Dr. Lauren Dvorscak of the UNM Office of the Medical Investigator. The suit claims that Dvorscak conspired in a cover-up of Atkins' cause of death. The suit says "Dr. Dvorscak wrote a report listing the cause of death as 'natural' due to pregnancy." 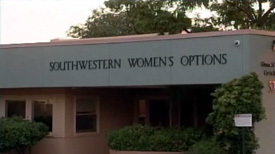 This is not the first time Southwestern Women's Options has botched an abortion. Far from it. SWO abortionist Shelley Sella -- lauded as a hero in the pro-abortion propaganda piece After Tiller -- has been disciplined for gross negligence in an abortion at 35 weeks that ruptured a woman's uterus, and ambulances have been called to SWO many times. In 2015, a former customer sued SWO for failing to disclose that her unborn child's body would be used for research. And the House Panel on Infant Lives has referred both SWO and the University of New Mexico for criminal investigation related to their roles in trafficking abortion victims' organs. Time and time again, SWO has escaped justice. We hope the Atkins family's lawsuit will fare better, and that they succeed in finally shutting down this menace to women's health and babies' lives.